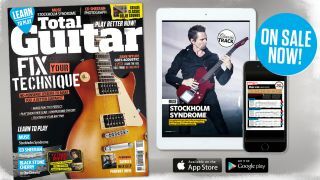 Plus, learn to play Muse, Black Label Society, Ed Sheeran, Game Of Thrones and more! TG279 is on sale from today, and this month it's all about fixing the recurring problems in your playing. From your gear, picking, legato, string-skipping to music theory, we've got you covered. The latest and greatest gear from the likes of Line 6, Boss, Washburn, Guild, Vintage, Ibanez, Electro Harmonix and loads more!